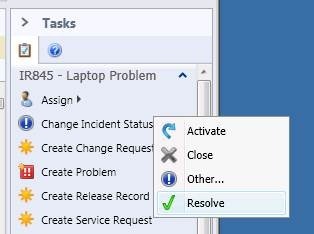 In SCSM 2012, the “Resolve” task has been moved to the newly introduced “Change Incident Status” task group. Following the procedures in this blog post to create a custom management pack allows you to also display this task in the root task list, where it used to be in SCSM 2010. Just create a new XML file named “SIS.Incident.Resolve.Task.xml” and paste the below code in the file. Save it, and then import it into Service Manager. 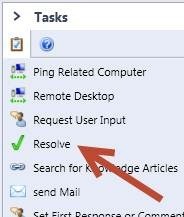 After restarting the console, you will find the “Resolve” task added to the root task list when one or multiple incidents are selected. Do I need to change the other things in the MP to make it a separated MP, or can I add this as a second item within the same MP? My client would like to have all the statusses (also custom made ones) listed in the “Change Incident Status”-field (without the need to use the Other..).